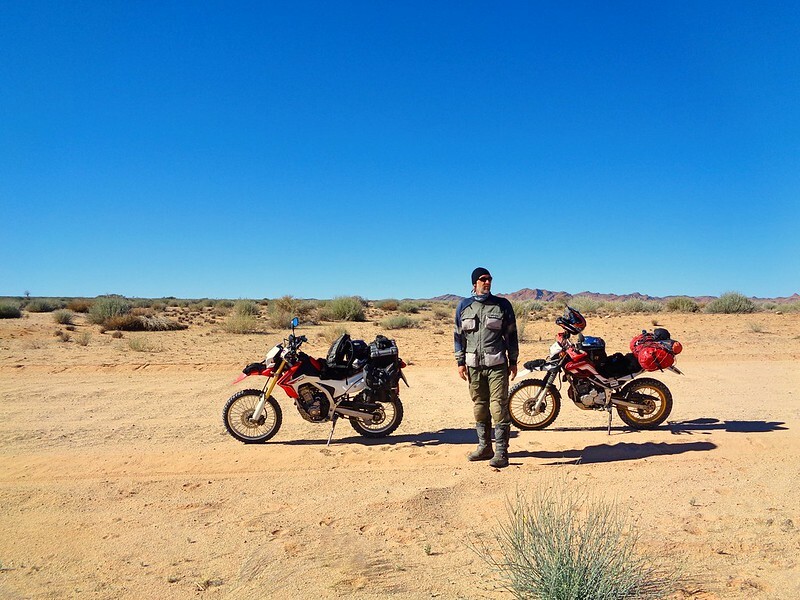 Discussion in 'Ride Reports - Epic Rides' started by maria41, Oct 2, 2018. 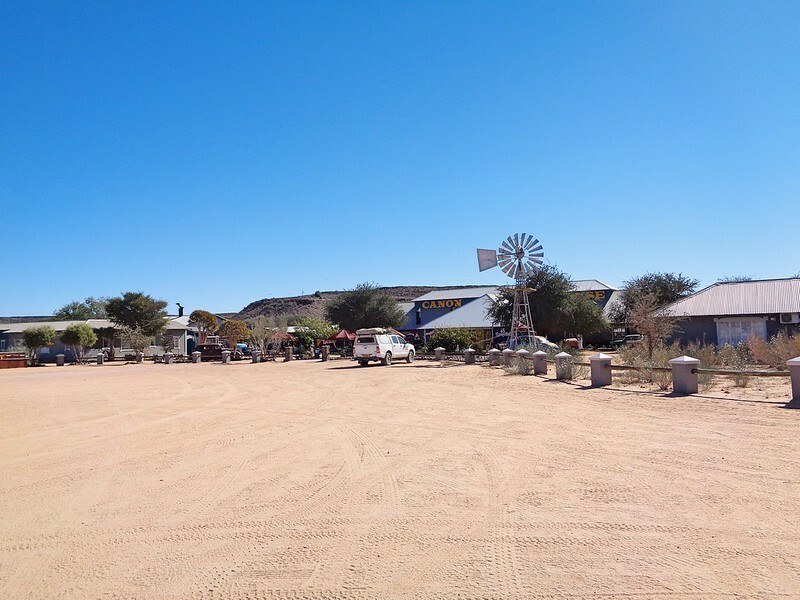 We had to get into Keetmanshoop to get enough cash as well as find a supermarket to buy enough food to keep us going for few days in the desert. We did not know what to expect in term of food and cash, for the itinerary I had in mind. My paper map was showing the fuel stations dotted around the desert, but I had no idea whether they would accept card payment or if they would have a shop attached to it! So, a town was useful for that. 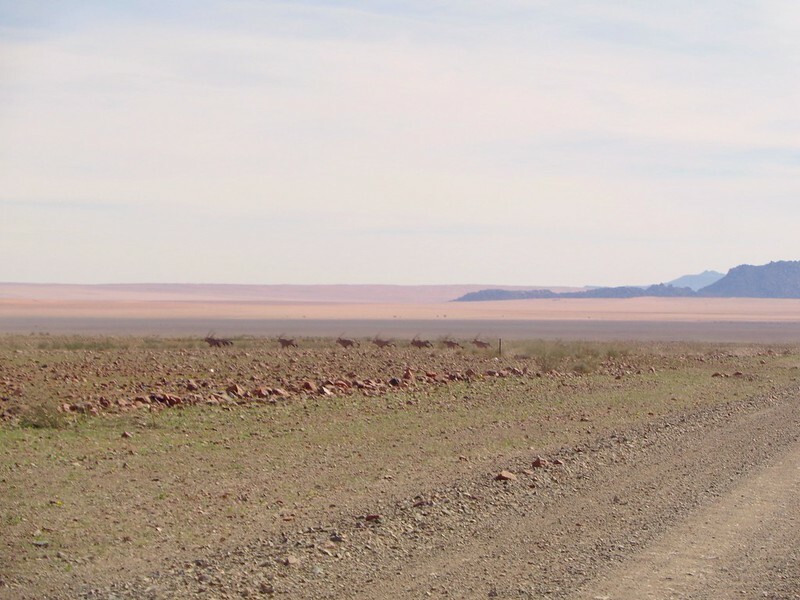 It was early days in Namibia and I still didn’t know what to expect. Buying fuel on the way. Funny how they like to keep very old cars standing around, rusting away. We saw this everywhere in Namibia. In town, we found a place to stay by following signs for a B&B. The landlady told us that it was not safe to walk out at night, so we went out for a very early dinner. Usually after a full day riding, we don’t like to get back on the bikes. And also, if we ride to some place for dinner, we can’t really get a beer or some wine if we are riding. The B&B owner told us how to get to a restaurant, not too far, and it was near some ATM machines. So after a shower we walked to what probably the high street, with banks and shops. Lots of local guys seemed to just hang around the ATM machine. Young, relatively well dressed, but just standing around doing nothing. I don’t like that. It makes me feel nervous! If they don’t use the machine, why are they hanging around the closed bank, like that? Anyway, we got cash and found the restaurant, which was empty. We shared a really nice spicy pizza, washed down with local beer. After that we walked back to the B&B, before nightfall. Davidprej, crashkorolyk, bobw and 5 others like this. 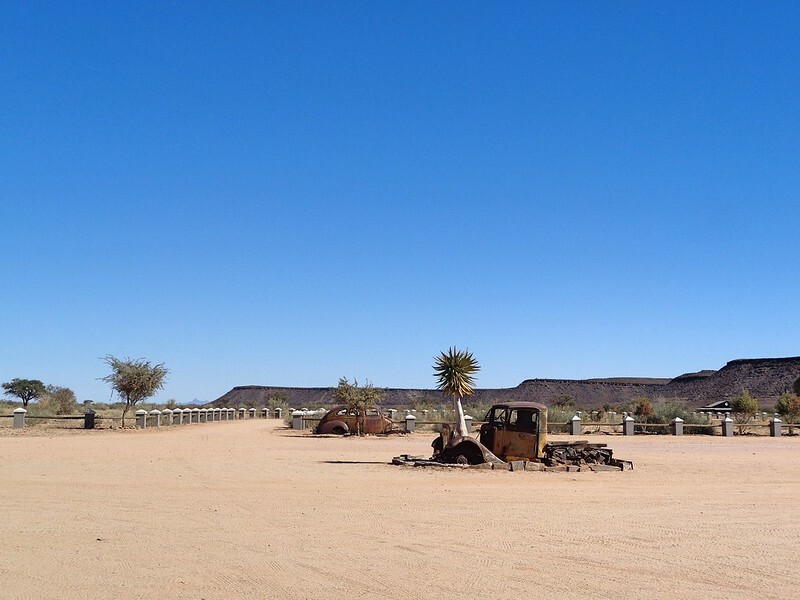 Those old cars are desert art. And I'll give you one guess why those dudes are hanging around the ATM machine !!!! After breakfast, we packed and rode to the supermarket. In a strategy that would turn routine, I would stay with the bikes, while Alistair would make an executive decision on what to buy. Obviously we had a list of essentials like bread, tins, instant noodles and peanuts. We debated whether to do the detour to see the Quiver tree forest. We got on the way but the gravel road was insanely busy for some strange reason, and we were in a constant cloud of sand. I couldn’t see the road and we got fed up. All that to see few trees that we could see from the side of the road in the region! 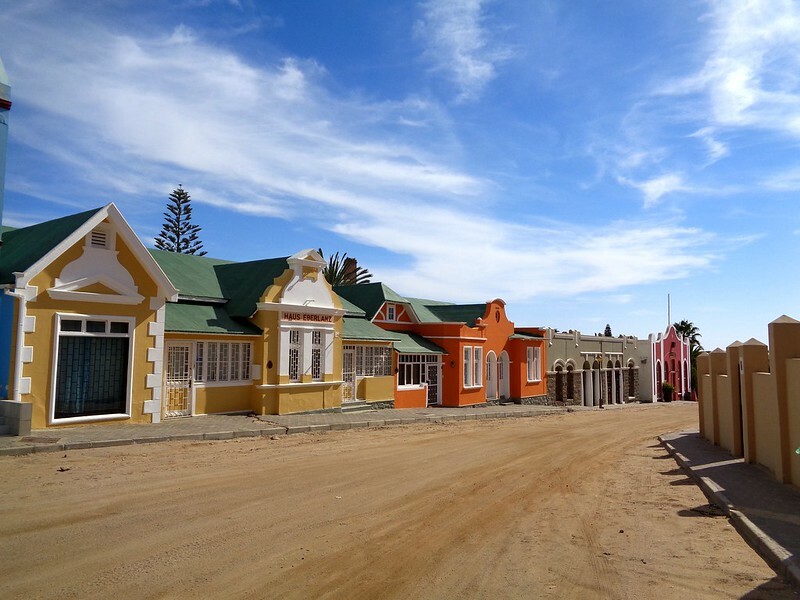 So we turned round, got back to Keetmanshoop and picked up the main road to Luderitz, the first coastal town in southern Namibia. It was a long way but it was all tarmac. The weather was good and I removed some layers. After 240 kms we stopped in Aus. In between there was not much! Aus is a very small settlement in the middle of nowhere. There is a fuel station, a large posh hotel (for some mysterious reason!) with a very nice big restaurant there, and a small village. I was on reserve. By my calculations, cruising at 100kms/h I could do 300kms. If I rode economy, I should be able to do more. Alistair told me this meant my bike was making 90 miles to the (imperial) gallon. Whatever. In Aus, we found the fuel station and the very luxurious hotel. We stopped in the restaurant for cold drinks and some cake. They had a very interesting menu at reasonable prices. 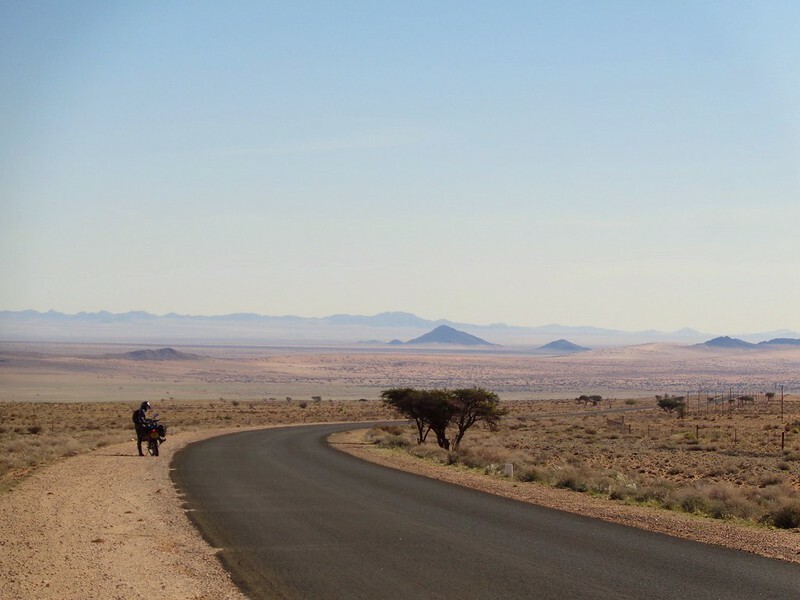 I made a mental note of this and decided to time it so we could stop there for lunch, on our way back from Luderitz. The coastal town is a dead end, and we would have to come back via Aus, before turning north. Next to our table was a large group of South Africans. We talked to them and they suggested for us a nice restaurant for seafood in Luderitz. Davidprej, bobw and Dirt Road Cowboy like this. 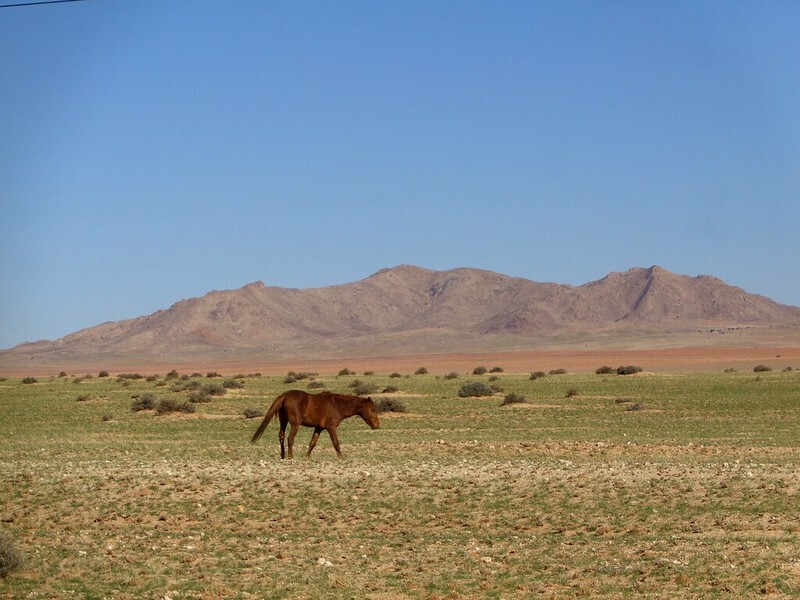 From Aus, the road took us through Garub Desert Horse National Park, which, unsurprisingly, had many wild horses! We also started seeing road signs for Oryx and hyenas! We saw a dead Springbok by the side of the road and also a dead hyena a bit later. I should have stopped for a photo of the hyena, as they are so elusive in the wild! We saw nothing else alive other than the wild horses. 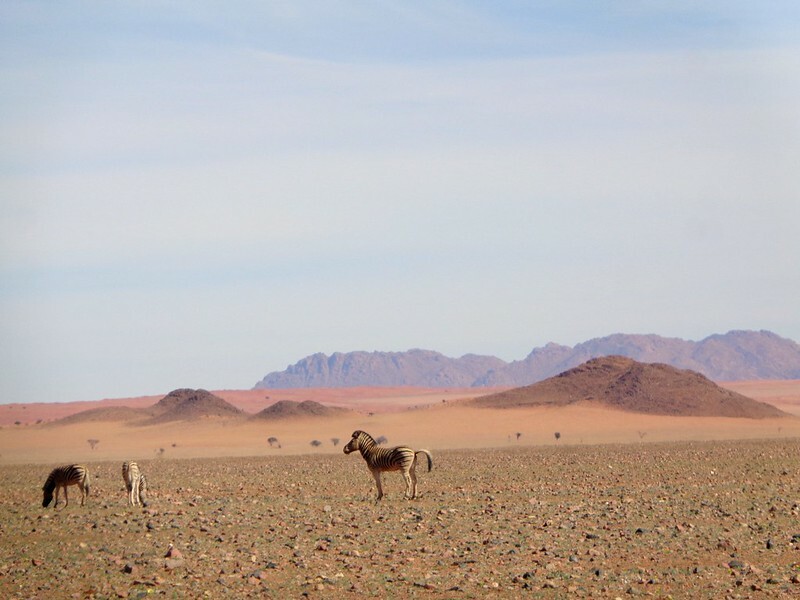 The Garub National park was stunning, with the pale green of the grass mixing with the ochre of the earth, the red sand of the far away dunes and the blue hills further away. It was breathtaking, like a delicate painting. 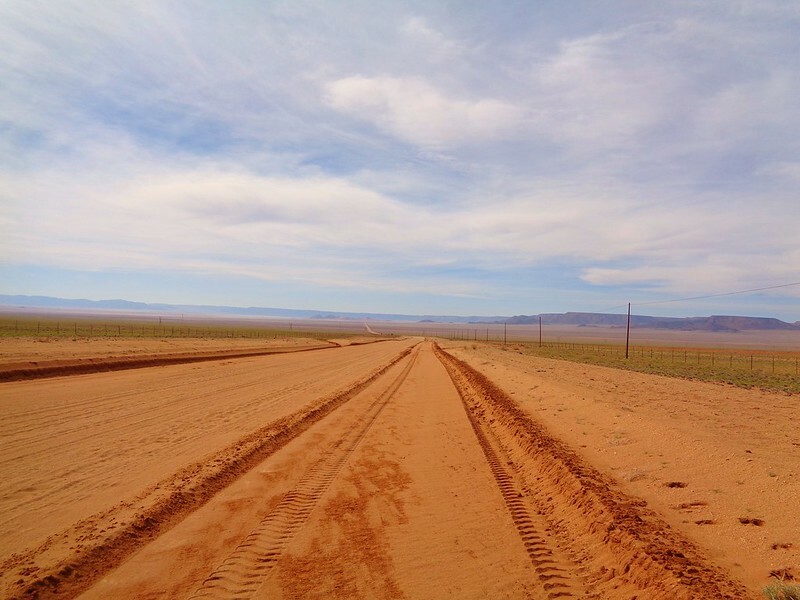 Soon, all this turned to desert and the long straight road became very boring. The wind came laterally and fine ribbons of sand were flying across the road like ghostly fingers trying to grab our wheels. We arrived in town and made it to the local backpacker place. It was a large house with very high ceilings. 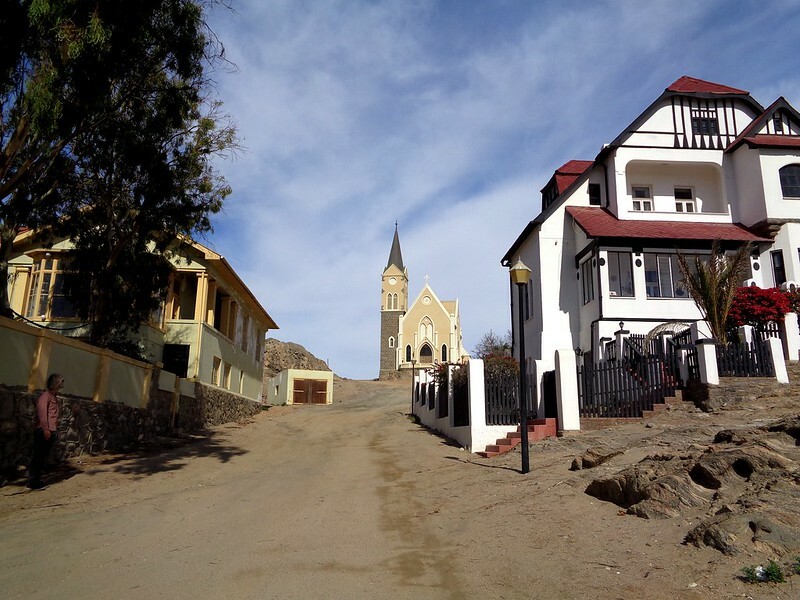 Germans founded Luderitz, and it had that German feeling with everything in its right place, spotless streets and buildings and no litter at all. The backpacker place had the faded grandeur of a rich family that fell in hard times. The floorboards were suitably creaking, as you walked through very large rooms, the paint and curtains very dated, tired dusty furniture… It was certainly not luxurious, but clean enough, welcoming and peaceful. The kind of place you felt at home. It had a large and well-equipped, if very old and tired kitchen, a very large lounge with sunken sofas set around an old capricious TV, a courtyard, a large backyard where we stored the bikes securely, and our room was massive. We were able to spread all our gear over the many beds! We felt comfortable here and decided to stay 2 nights so we could visit the town and the area. The place was very quiet, it was still low season, but we talked with few residents. Davidprej, crashkorolyk, bobw and 2 others like this. 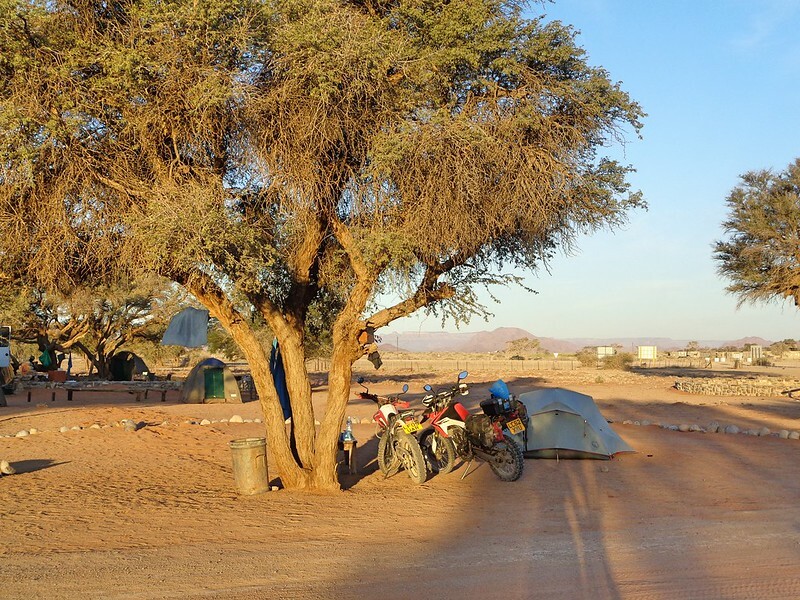 One of the backpackers resident was an old bloke who sounded German but was actually Namibian and had been living in the backpacker hostel for the last 9 months. There were also two young men, James and Jonas, one British and the other Swedish. 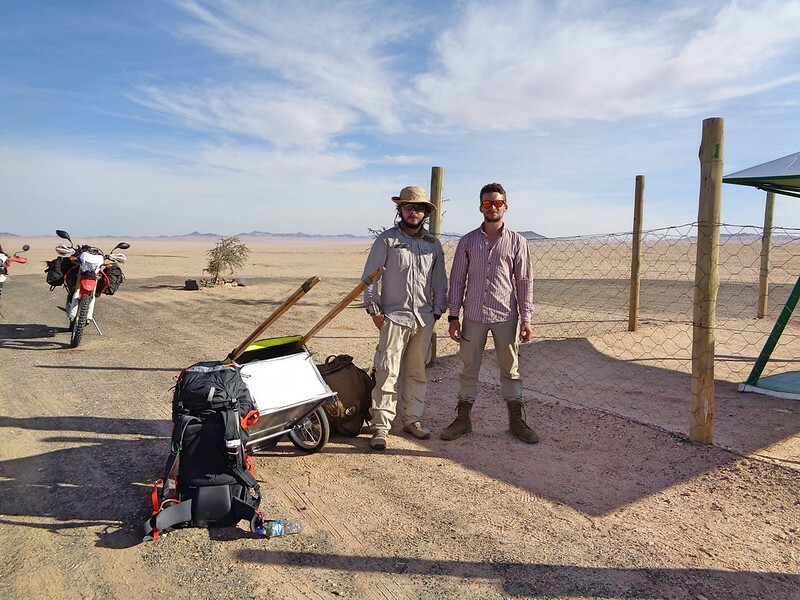 They were attempting to walk across Africa, starting in Luderitz and ending somewhere across in Mozambique. We thought they were mad! But then lots of people think we are too! The trolley they were pulling had its wheel bearings destroyed by the very violent sandy wind that blows in this region, 50kms from Luderitz. They had to come back to Luderitz for repairs. We spent some time talking with them. Apparently, one day, while resting, they saw 5 lions staring at them from about 200m. After a staring contest of few minutes, where they did not dare to move at all, the lions left but the guys tried to put as much distance as possible from them. They had nothing to defend themselves and there was no wood to make a fire. They had quite a fright, but both did 5 years in the army, so I thought they should be able to deal with whatever Africa could throw at them! The locals told them there were no lions in the area, but they were adamant they made no mistake. I think, being ex military, they should be able to observe and reliably report what they saw, so I totally believed them! Lions can roam a long way to find prey. The German sounding old man asked me about retiring in France. 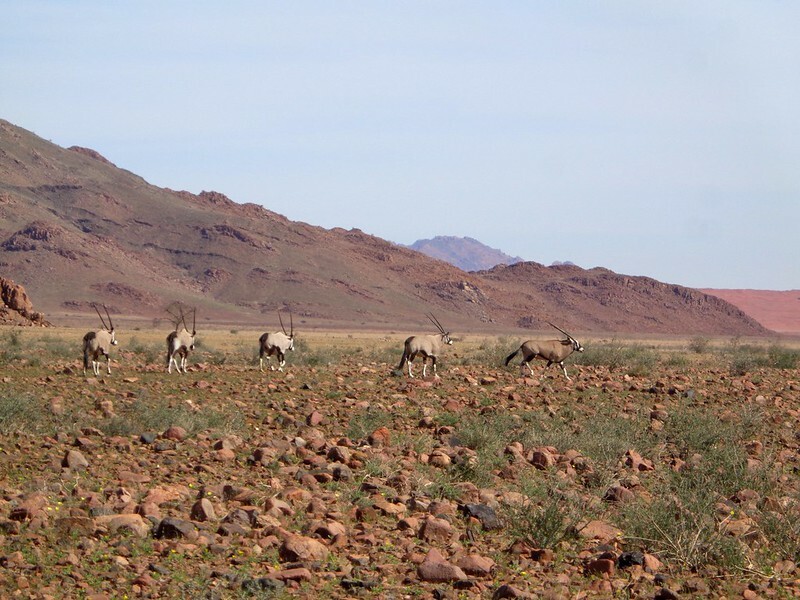 He seemed disillusioned by the direction Namibia was taking and wanted to retire in Europe. Funny conversation but I struggled with his very strong German accent. Remember Namibia was colonised by the Germans and the evidence is everywhere to see, including the language. Anyway, he seemed interested in France or Spain. Both are nice places to retire. 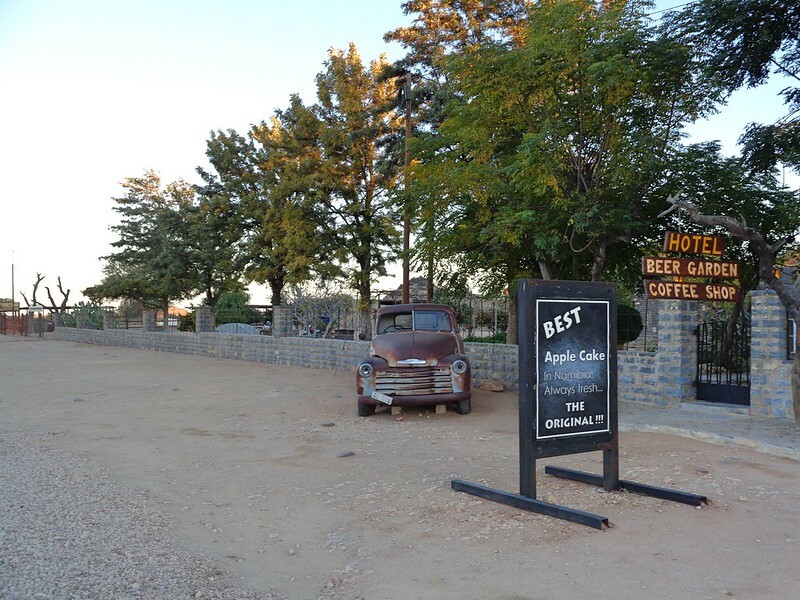 I guess the old Namibians with German or British descent, have seen so many changes since the 50s, that maybe it is a bit overwhelming for them. The world they knew is gone, and the future can appear bleak. Davidprej, bobw, joenuclear and 1 other person like this. We sorted few things out and I tried to do some planning using the very unreliable wifi. We also had a good walk in town. 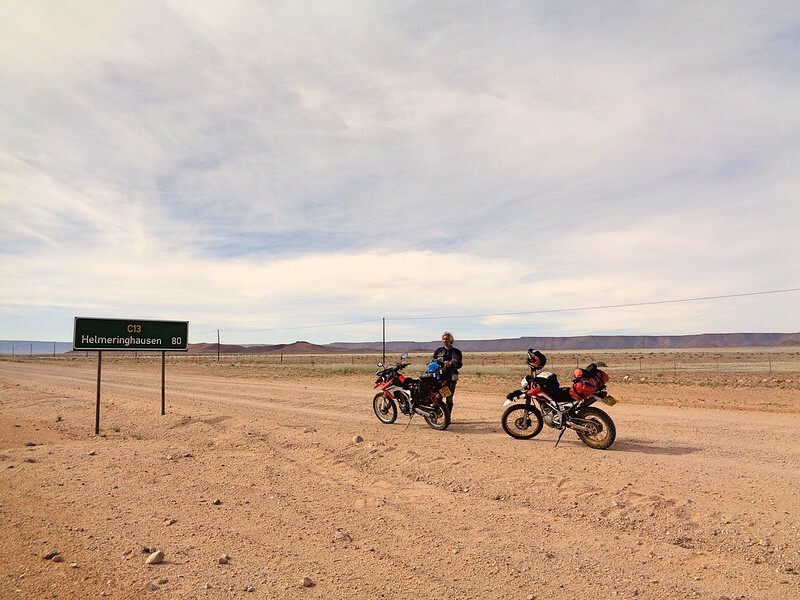 We thought about riding to visit Kolmanskop, a famous ghost town about 15 kms from Luderitz. We needed a special permit to get there or go with an organized tour, because it is in a diamond exploitation zone! So it was not possible to just ride and have a look around. In the end we got lazy and decided not to go. In the evening, James and Jonas left. For them it was best to walk through the evening and part of the night, when it is cool, and early morning, avoiding the hot part of the day. The place was very quiet. Our bathroom had no light, as there had been some huge storms and lots of rain 2 weeks earlier and it messed up the antique electric wiring in the house, as well as the gravel roads, we would find out later! In the evening, we repacked everything in a more efficient manner. It always takes some time into a trip, to know how to do this in the most efficient and convenient way. At this stage we were still experimenting what to put where and how. Back in London, I had made 2 bags (one for each pannier) that fitted perfectly the panniers, inside. So we could pull out all our gear from the panniers and carry it in one go. I may have mentioned that once the top box is screwed into the CRF250, we cannot remove the soft panniers. The straps are under the box. So we could not, as in previous trips, unstrap the panniers and carry the whole lot into our room. The inside bags were planned to do that and empty the panniers in one go, but they were not easy to put back into the soft panniers. Eventually it became evident that it was easier to neatly cram the panniers more efficiently with all the stuff, then leave the bags on top, when loading the bike, and in reverse, to fill the inner bags to transport all the stuff out to the room, and back to the bikes. I started also using an auxiliary roll bag, for the food and warm gear. Our provisions included some bread rolls, a can of baked beans, 2 pack of sachet soups and 2 packs of instant noodles. And peanuts. I suspect Alistair had also a big stash of biscuits and sweets hidden somewhere. Davidprej, bobw, Brick Top and 2 others like this. 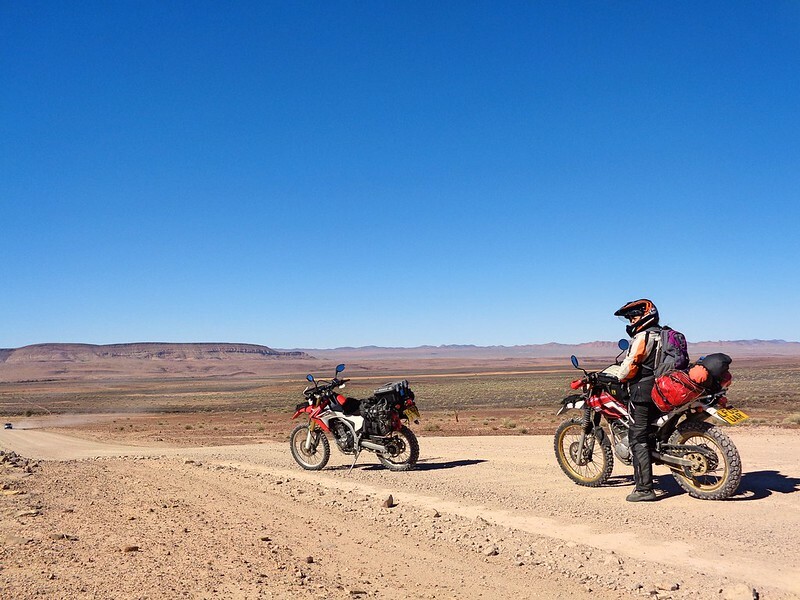 We left the backpacker place early, keen to make as much progress as possible on the un-surfaced road starting beyond Aus. The backpacker owner had told us a section would be very sandy and like a riverbed. So we rode back to Aus, about 125 kms away. On the way, we came across James and Jonas, having a rest in a shaded area. We mentioned to them that the water drains on the road and rail track that runs along the road could be ideal for shade during the hottest hours of the day. We got this trick from a cyclist we met in Uzbekistan. After a long chat we continued. We arrived at Aus later than planned but perfect time for an early lunch! I had not forgotten the splendid menu. I had an amazing burger, with superb meat! We also got some fuel. We then set on the un-surfaced road. The 1st 20kms were a nightmare. It was like a riverbed with very deep sand. I hate sand. For a while, the right side had been kind of compacted, so I put the bike on that side and rode until we reached the caterpillar. After that, it was back to deep fluffy sand. After that sand section, we were able to increase speed. It was badly corrugated but we were able to make some progress. On the way I saw 3 brown foxes playing and jumping on the side of the road. Davidprej, crashkorolyk, bobw and 3 others like this. We finally arrived in the hotel/ fuel station / campsite / shop at a cross road that is Helmeringhausen. The grounds looked nice and we decided to stay there. In any case, there was nothing for a very long way so we did not have much choice! We put the tent up in a grassy area. 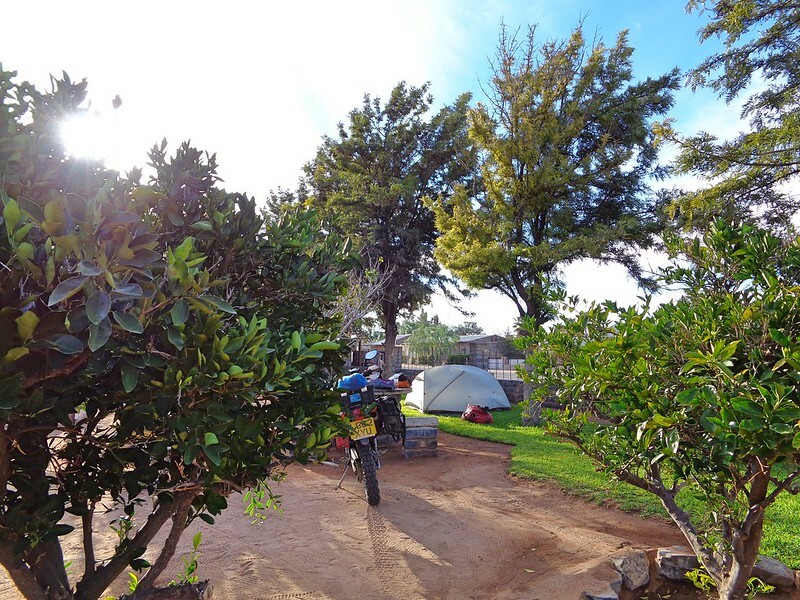 The campsite was in a large garden surrounded by orange and lemon trees, with big pens of goats and geese, nearby. The hotel was super expensive. We asked if they could do a discount, considering it was empty, but they refused. A couple of South Africans, on a 4×4, arrived and rented a cottage on the other side of the road, for the night. 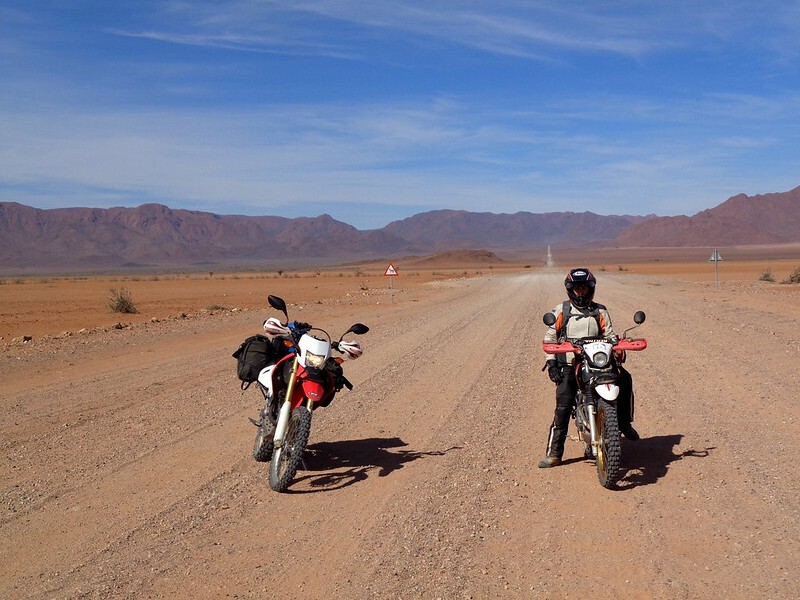 bobw, mbanzi and Dirt Road Cowboy like this. 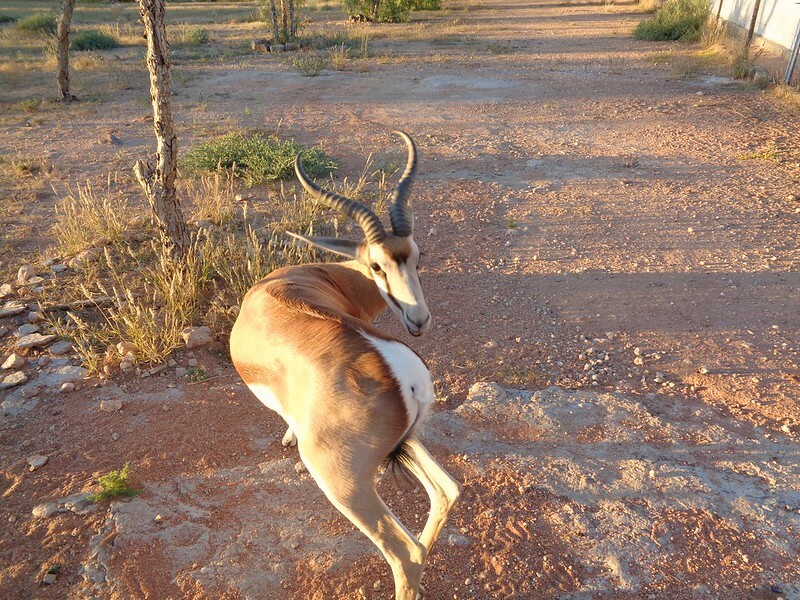 After a quick shower, we went for a walk along the single street/road and met a tamed Springbok, behind a fence, in a paddock. We could even touch it from over the fence, although he was still trying to ram us a bit. After a small diner (eating our 2 sachet soups) we noticed that the generator had stopped. The ground’s staff locked everything, switching off all the lights in the compound and left. The whole area, including all the buildings, was left in complete darkness. With no one using the hotel, all was locked up and deserted. No one was around. No light other than our torches. The South Africans in the cottage were not close. As it got dark, the sky, without any light pollution or clouds, was amazing. With electricity working only in the shower block, we spent some time there reading before bed. Few hours after we had gone to sleep, I heard men talking and could see a torch being used around our tent and the grounds of the hotel. I was a bit anxious, but in the end it must have been only the staff checking on geese and goats in the pens. The night was very cold, as we are at 1400m. Davidprej, crashkorolyk, bobw and 8 others like this. Great report. Thanks for letting us follow along! 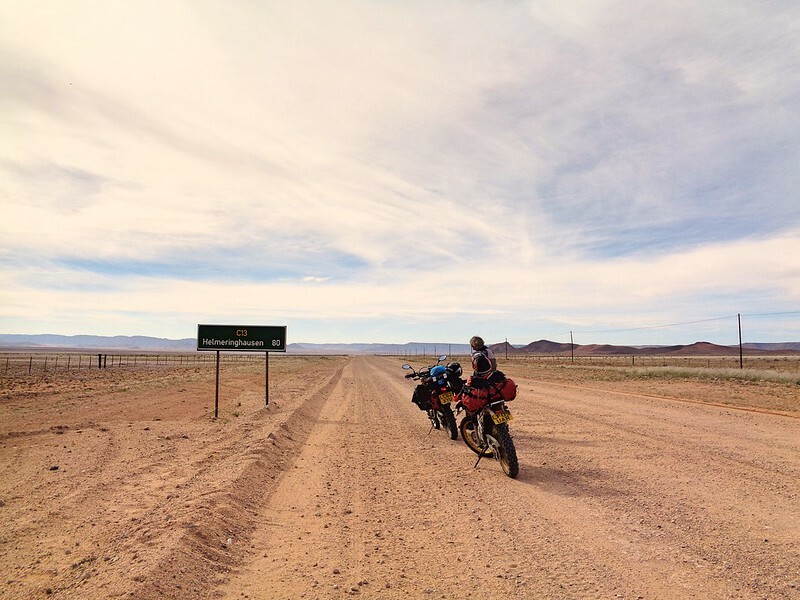 Day 12 – Namibia, Sesriem – 250kms – Saturday 9th June. We woke up very early. The weather was sunny and beautiful but rather cold. Soon it would warm up once the sun rose further up. The hotel staff was already in the grounds, tending the gardens. We had a quick breakfast with bread rolls and the local version of the Laughing Cow cheese triangles. After that we quickly packed the tent and we were back on the road. There were two roads going to our next destination: Sesriem. We decided to take the shortest route. We were told later by locals that it was the worst one! 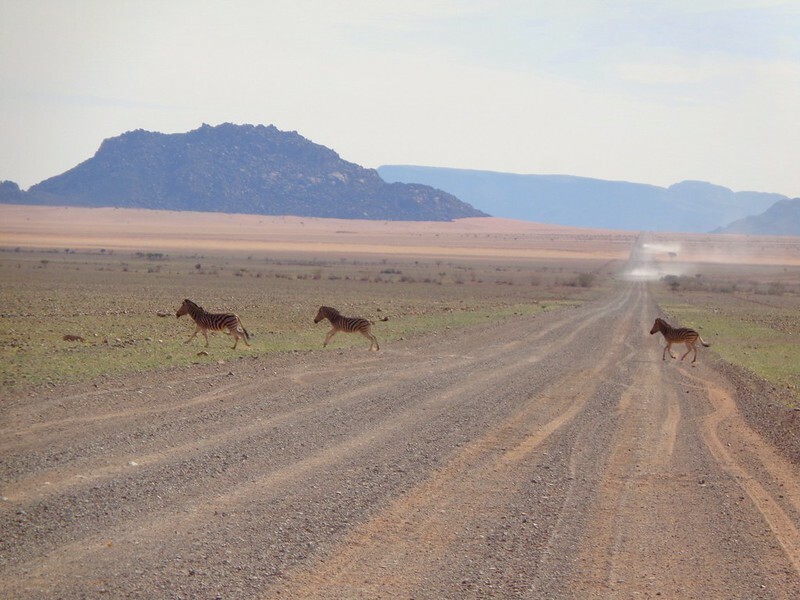 The road was indeed in very bad condition (once again the bad weather few weeks before had left it in a bad state) but seeing our first close range Oryx and zebras in this desolate area was rewarding. They were so beautiful as they all ran along us and across the road. Davidprej, crashkorolyk, bobw and 4 others like this. Too many photos? 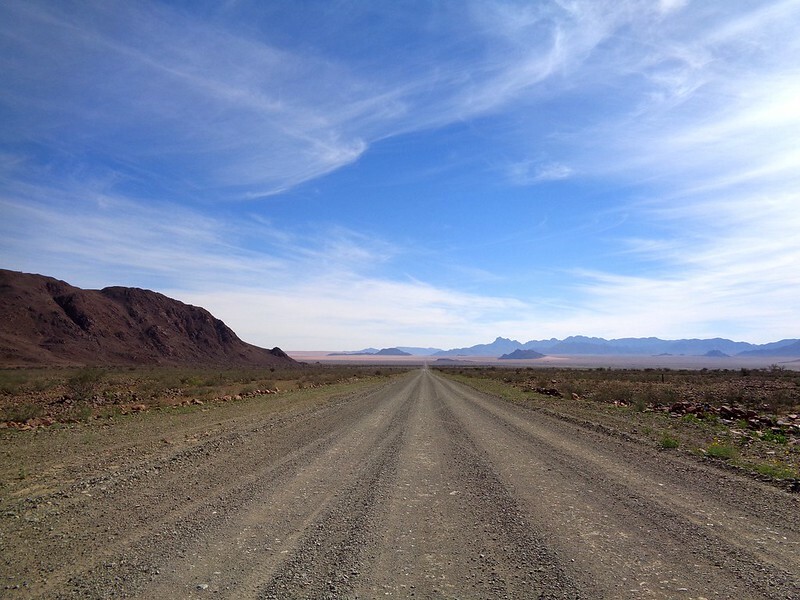 Namibia is so spectacular! 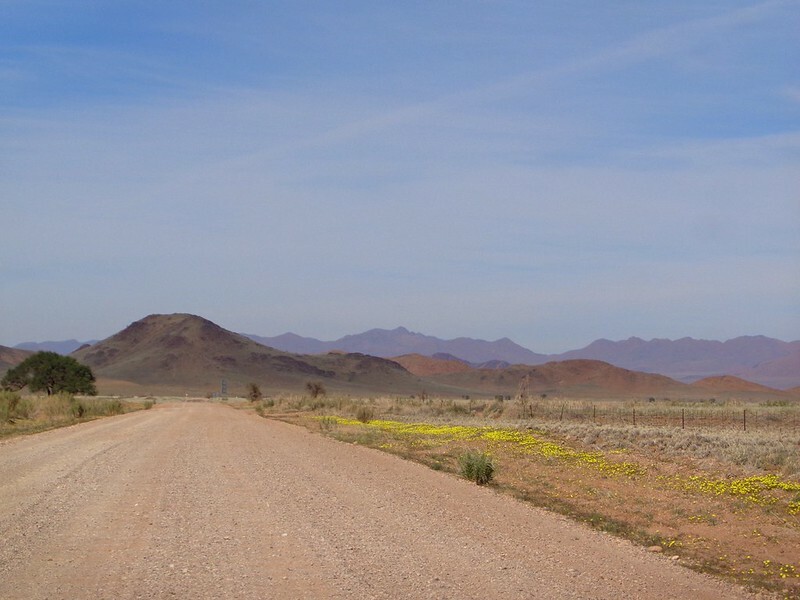 The road was also deserted, we saw very little traffic, and it was magnificent. 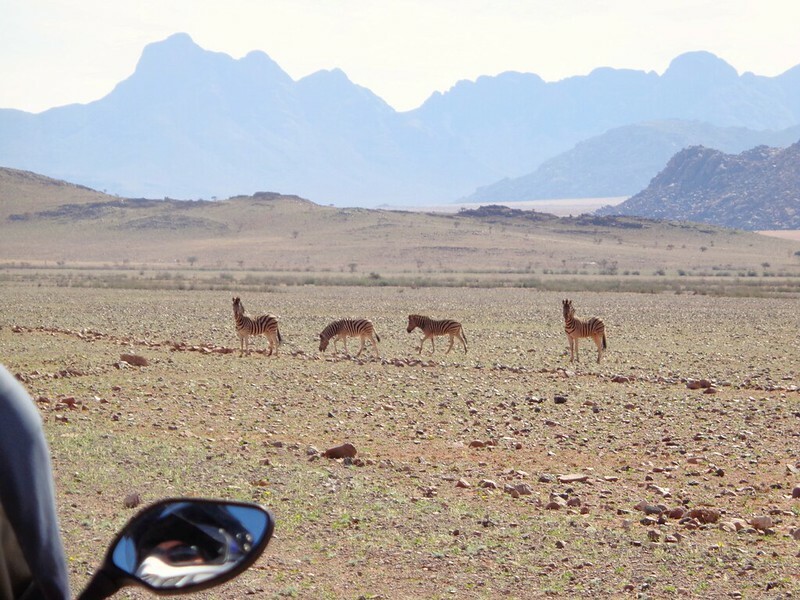 It was exactly what I had in mind while planning Namibia. After a long ride, we made it to Sesriem. 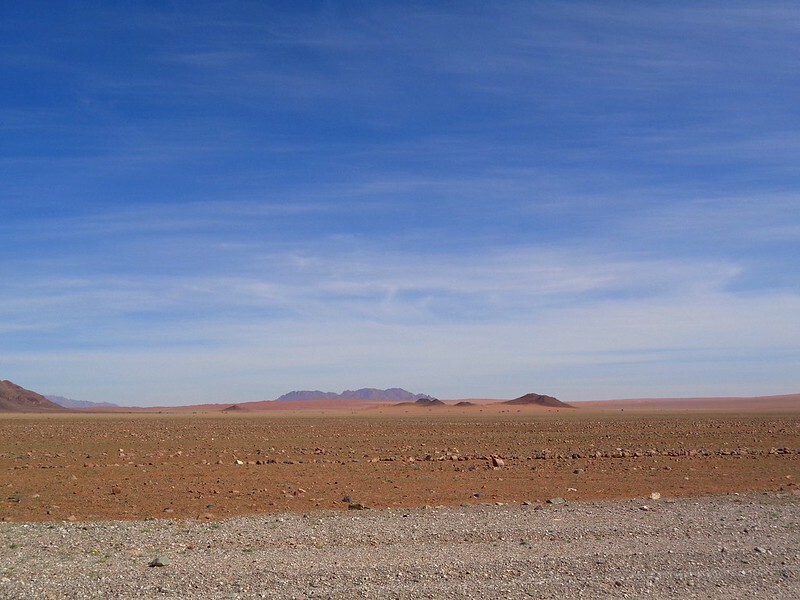 The place was only few sandy dusty campsites in the desert. 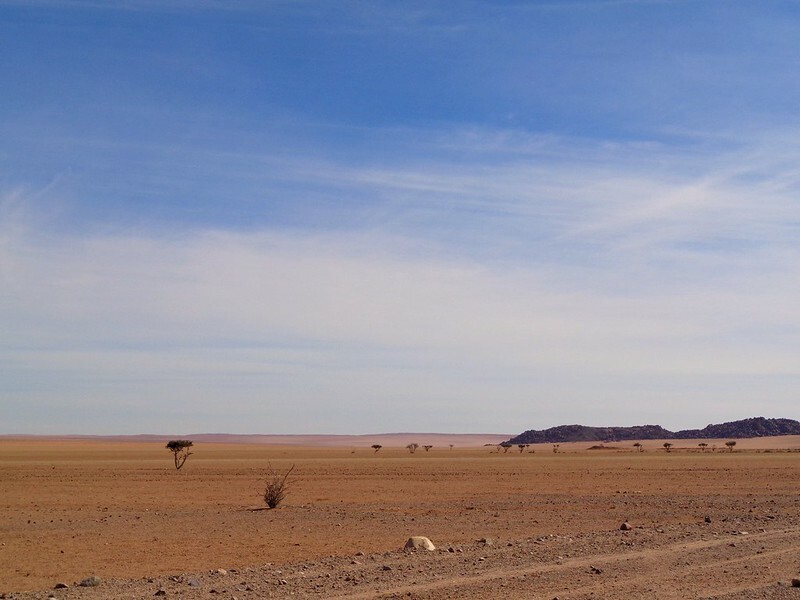 It is the get away to visit Sossusvlei, one of the most visited places in Namibia, with very tall red sand dunes and the flat salt lakes. Davidprej, forgorin, crashkorolyk and 6 others like this. As for "too many Photos?" No such thing!! Love to live vicariously through folks like you and Alister who can and do things I only dream of. 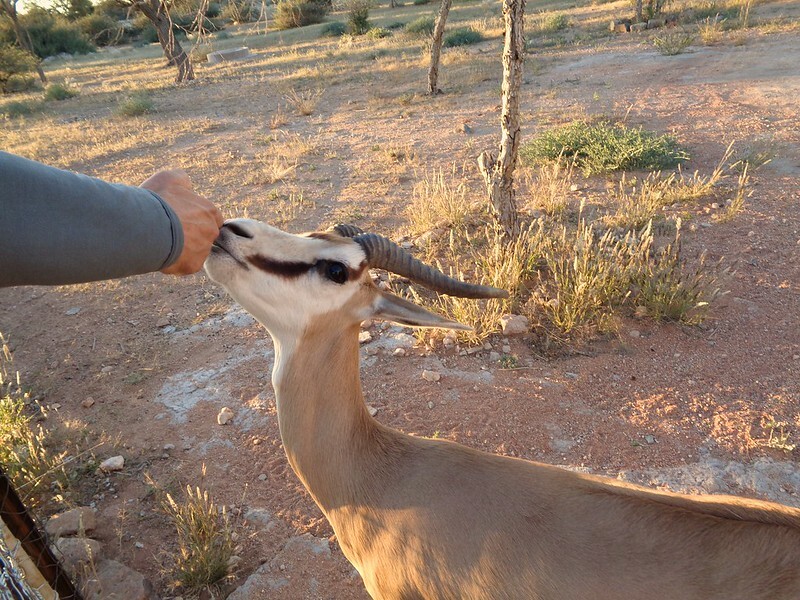 Arriving at Sesriem, we decided to stay in the National Park campsite. 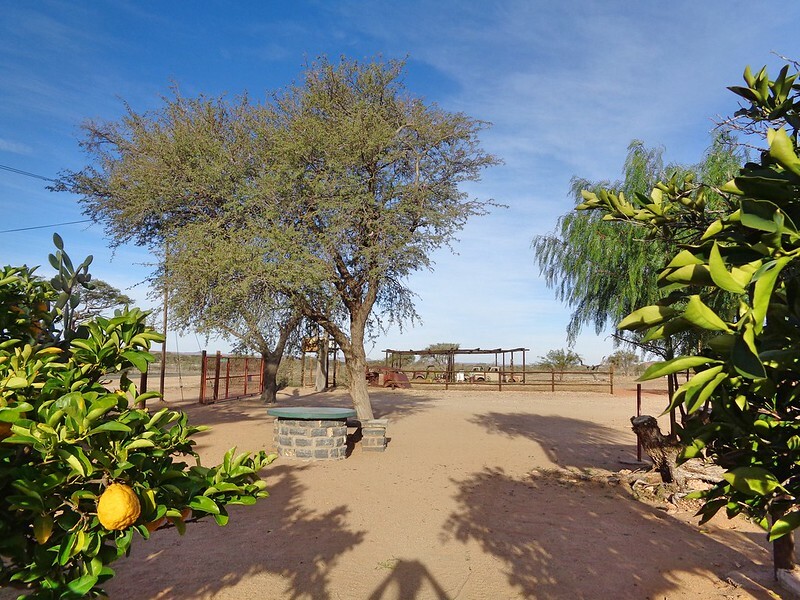 There were many campsites to chose from around as well as many luxury lodges. 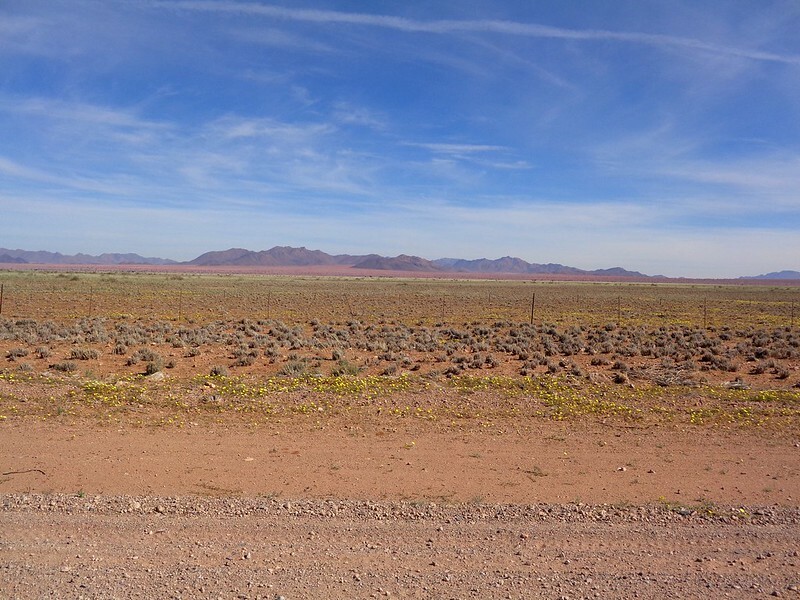 Outside of the campsites and lodges, it was just the desert. One of those luxury lodges (according to our 2 year old Lonely planet) charged about 900 dollars per person, per night! It may be all-inclusive, but for that sort of money I would expect unlimited champagne on tap! Yeek! Hell, I would expect the taps to be gold! How can anyone justify such expense? The average salary in Namibia is a pittance. After paying Park fees and campground, we set up our tent in our little allocated spot, containing a big round cement thing for fire/BBQ, a thorny big tree for shade and nothing else much. The shower blocks were not too bad but busy and the hot water had run out. I can’t remember the price but with all fees included it was quite expensive. The only advantage of having motorbikes is that we did not have to pay a parking fee in top of everything else! We managed to 'find' a bench from an empty spot. Presumably this bench had been 'borrowed' from the bar. We thought we could continue the 'borrowing' and have somewhere to sit to have breakfast and dinner. So we quickly moved it near our tent! Davidprej, BrixNaix, crashkorolyk and 5 others like this. 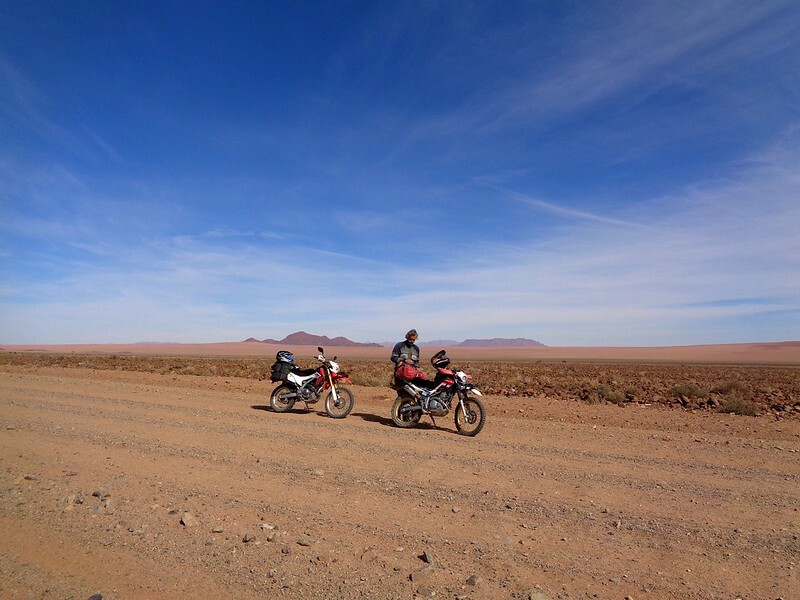 We could not go to Sossusvlei with the bikes and visit the various locations. Only SUV were permitted into Sesriem. We asked the ladies at the reception desk if there was a vehicle that could take us there. They told us the price but also advised us it might be cheaper and easier to ask around to the owners of 4×4 or the large guided tours on big tourist trucks. There were a couple of groups travelling in massive trucks. As it was still low season, they were not at full capacity and had plenty of space for hitchhikers! I went round and asked few tourists on big rented 4×4, but they all had too much stuff on the back seats to take 2 passengers. Not far from our camp, there was a group on a big truck. I walked to the truck and, while a guy was getting off the driving cabin, I asked him if he was the driver. He was the guide. That was how we met Zee. 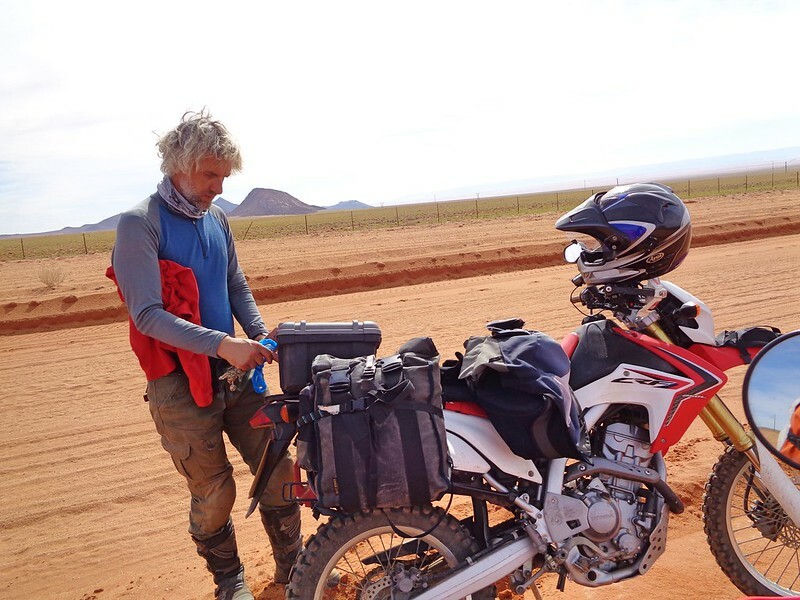 He was guiding a small group of French for a 3 weeks tour of Namibia and there was plenty of space in the truck to take us to the dunes. So he had no objection but he needed to check with his clients first. Later on he told us it was ok and that we would have to discreetly (away from the French) had a chat with the driver as well ( i.e. the driver would expect some tip). As the campsite was just sand and desert, with no light, there was not much to do. So we went to the bar to sit and read a bit. There was no WiFi. 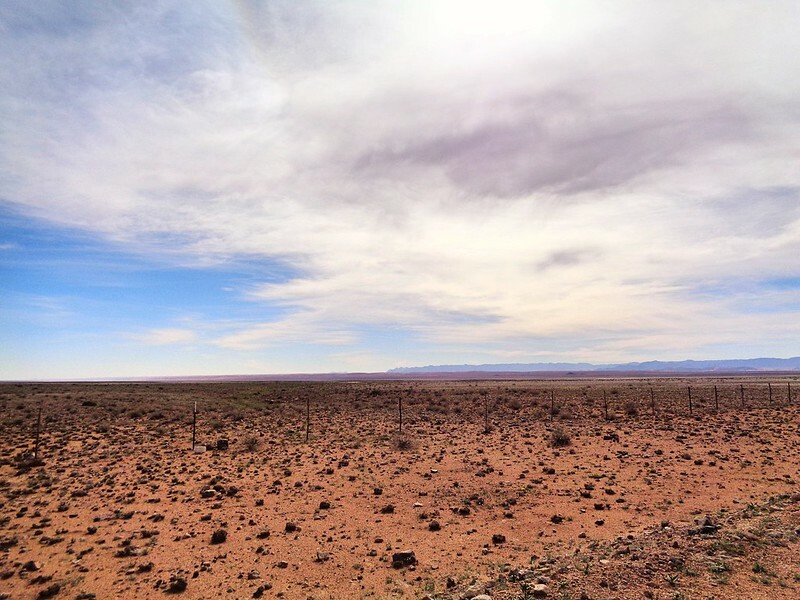 To be fair, since we had crossed into Namibia, even in places where there was WiFi, it never seemed to work! But the TV was on and a small crowd was watching football and the world cup by the bar. Alistair went to watch that, while I read one of the few books I had previously loaded on my iPad for such circumstances. 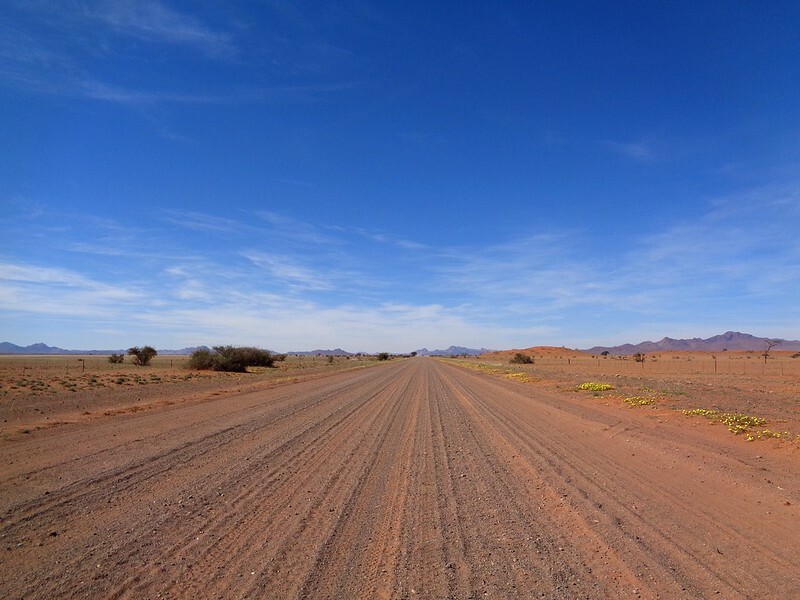 Zee came to confirm that they could take us to Sossusvlei. We did not stay up late, as we had to be ready by 6am the next day! Davidprej, bobw, mbanzi and 4 others like this. Enjoying your ride report. We just came back, 2 weeks ago, from riding in much of the same area. It is nice to see the country through your photos, I was pretty busy watching the road.